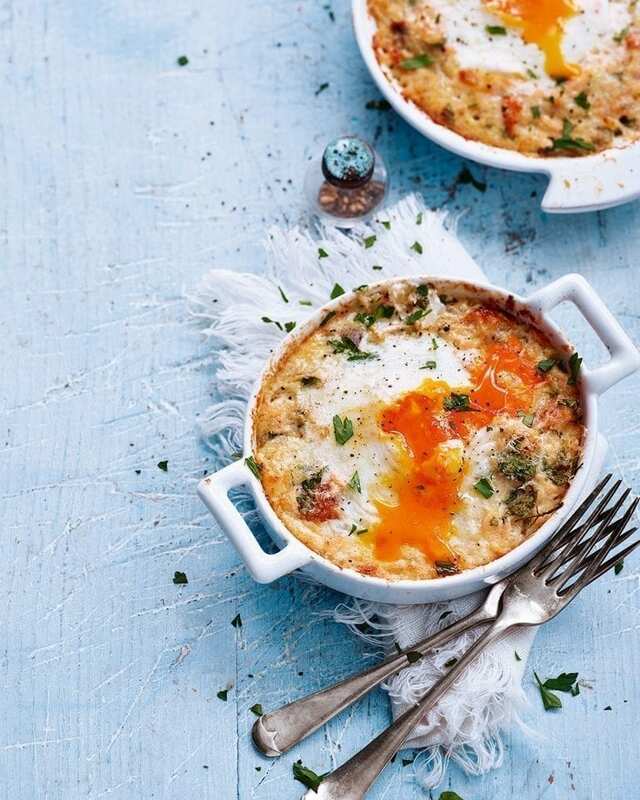 Imagine dunking hot buttered toast into the yolk of these creamy, decadent eggs baked with hot-smoked salmon and parmesan. Heat the oven to 200°C/180°C fan/gas 6. Melt the butter in a saucepan, then add the chopped onion and fry for 5-8 minutes until soft. Turn off the heat and add thecreamed horseradish, double cream, hot smoked salmon, chopped parsley and lemon juice. Season to taste, then divide the mixture evenly among 4 small ovenproof dishes. Make an indentation in each mixture with the back of a spoon, then crack 1 egg into each. Grate over parmesan, loosely cover with foil, then bake in the oven for 20 minutes. Remove the foil and return to the oven for another 5 minutes until the egg white has set. Serve straightaway with hot buttered toast.